Walter W. Ahlschlager was the architect who designed the Sheridan Plaza Hotel at Wilson and Sheridan, as well as the Broadway Building at Broadway and Leland (now undergoing a restoration.) 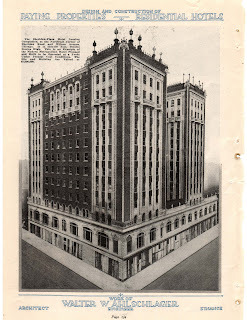 This image of the Sheridan Plaza hotel comes from a 1921 issue of American Builder magazine featuring Ahlschlager's work. A facsimile of the entire article is available as a free download from CompassRose.org.